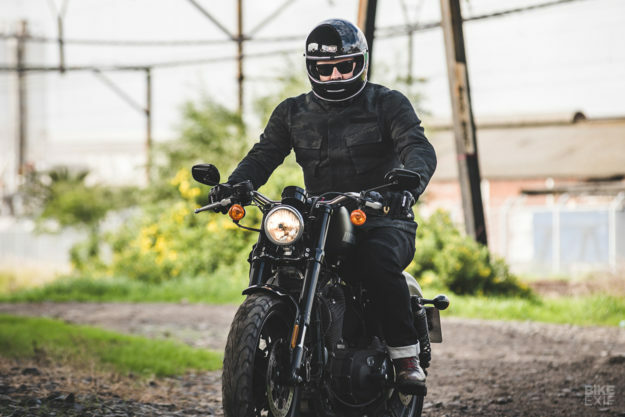 This week, we’re looking at a high-end pair of riding jeans, an entry-level helmet, and a stylish military-style jacket that sits in between. Let’s dive right in. 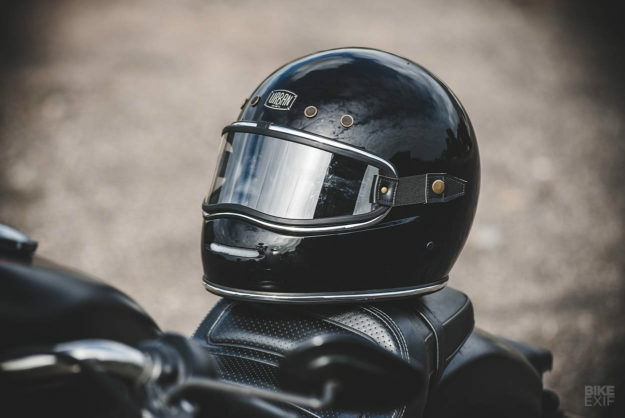 We’re spoilt for choice when it comes to retro helmets, with plenty of options at both the high and low ends of the affordability scale. 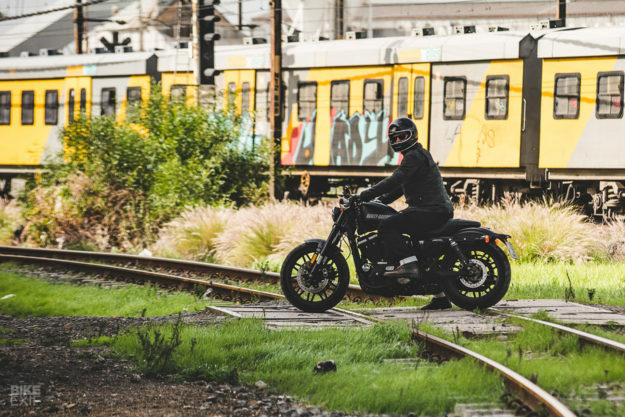 Urban Helmets’ BigBore full face helmet won’t cost you an arm and a leg—but its premium look suggests a much higher price tag. 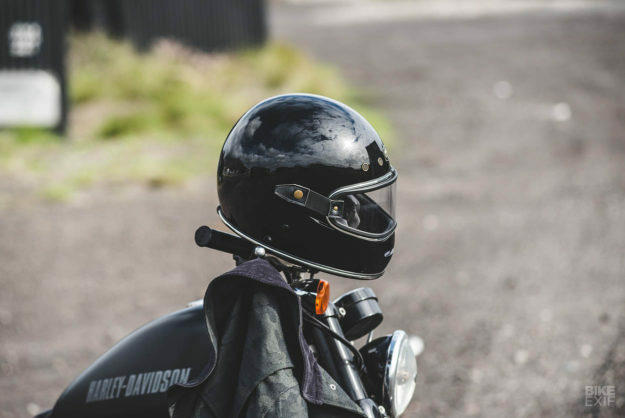 The general vibe is classic race helmet, with a narrow eye port and a high jaw. 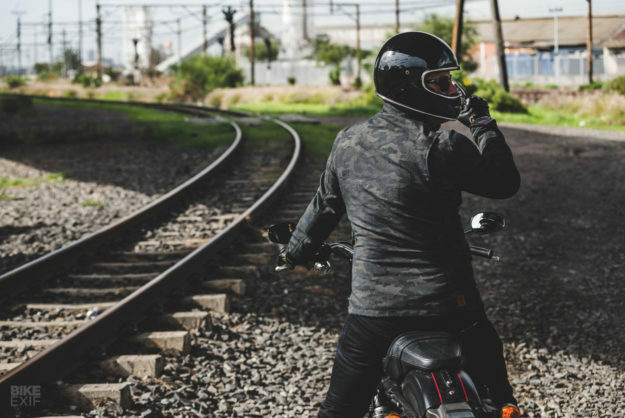 It’s close to Biltwell Inc.’s popular Gringo, but with more curves, and with a couple of extra details. The narrow mouth vent, and round vent holes across the top, are more than just a little reminiscent of Bell’s Bullitt. And the removable visor is much like the one on the Nexx XG100—attaching to the shell via elastic straps, with press studs. Out the box, the BigBore looks and feels great. The gloss black finish I opted for is downright classy, with a slick chrome trim along the eye port and bottom. 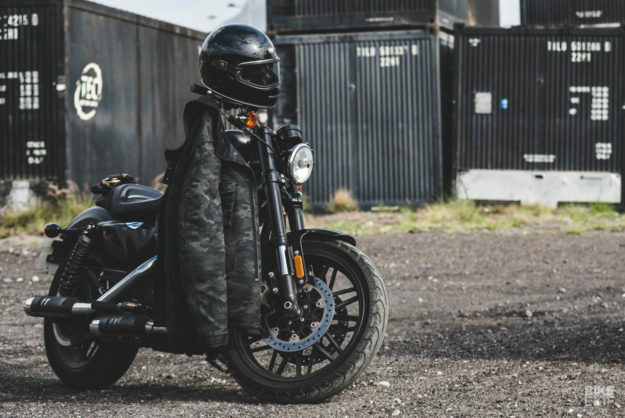 It’s finished off with nifty details like an Urban Helmets logo up top, and faux leather trim just below it and at the back. There’s even some contouring on the side that serves no purpose, other than to reinforce the throwback race helmet vibe. Compliments abound whenever I wear it. Popping the BigBore on reveals a plush interior and a true-to-size fit. It’s comfy out the box without any pressure or friction points, and cinches down with a run of the mill double D-ring strap. The liner features an neat contrast-stitched diamond pattern, and there’s a spare set of cheek pads in the box. I do have one big gripe with the BigBore though, and that’s its visor. When it’s ‘on,’ it actually seals pretty well, thanks to a strip of rubber that runs around the eye port. 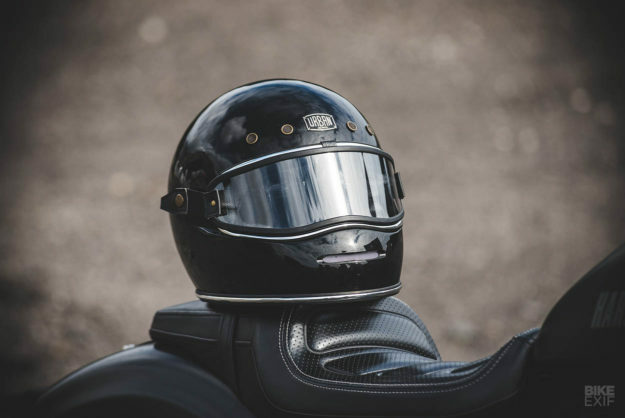 No helmet of this type’s going to block wind noise on the open road, but the visor does make it a touch quieter. Here’s the rub: it’s impossible to get the visor on and off with one hand, and when it’s off, there’s no decent place to put it. It seems natural to push it up like a regular visor, but after just one ride of doing that, the ‘vents’ will scratch the daylights out of it. And at any sort of speed, the wind starts picking it up. 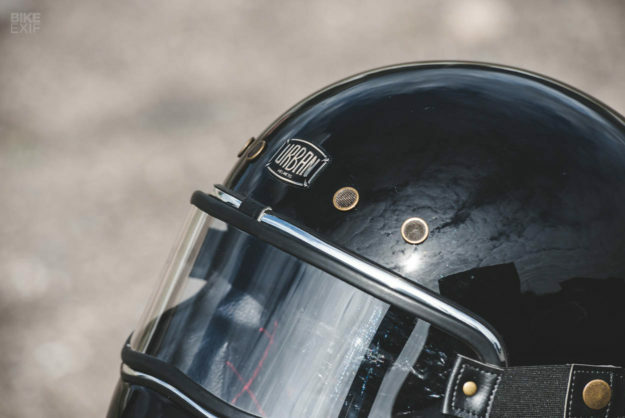 What’s more, I regularly have to re-align the rubber trim on the visor itself, which has a habit of popping off. Without the visor attached, your only option is a pair of shades, because no goggle’s going to fit into that narrow opening. Granted, most of those issues plague any visor system like this. But I reckon this is one feature that deserves a little more time on the drawing board. 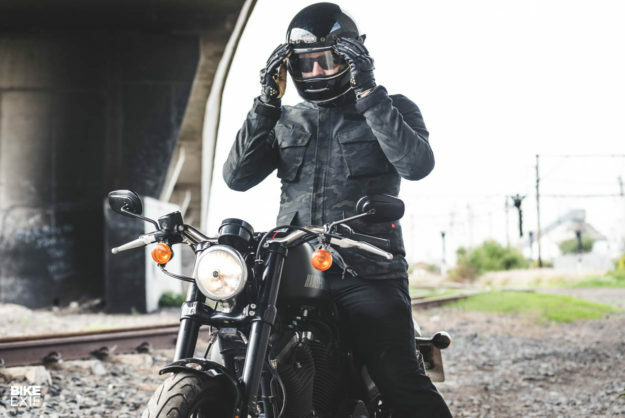 The basics: single-layer, military-style riding jacket; Knox CE-approved shoulder and elbow armor; EUR379. 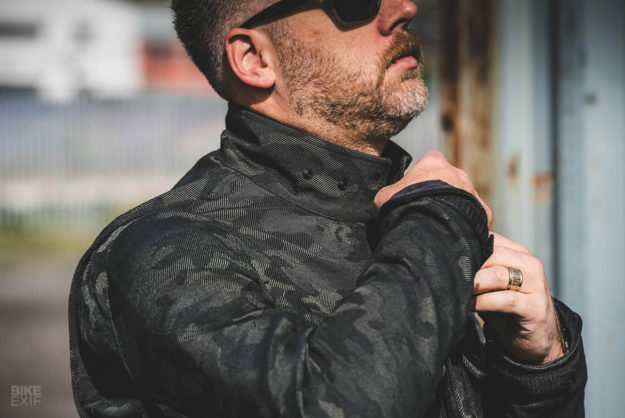 As its name implies, the M65 is inspired by the classic military field coat—but with a few moto-specific features. 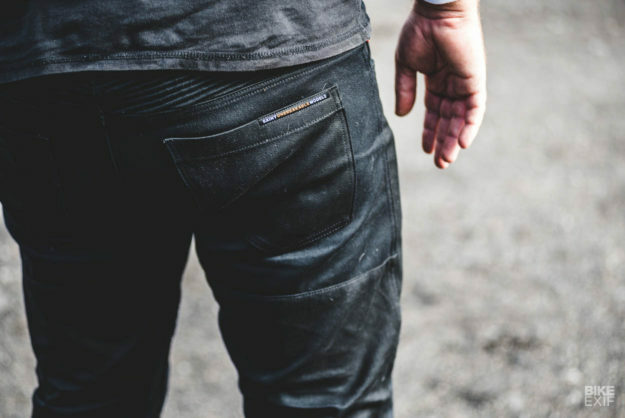 It’s a traditionally longer, four-pocket design, made from 16 oz canvas woven with Dyneema (an ultra-strong fiber that adds abrasion resistance). Camo isn’t usually my deal, but it’s subtle enough here that I actually like the aesthetic. 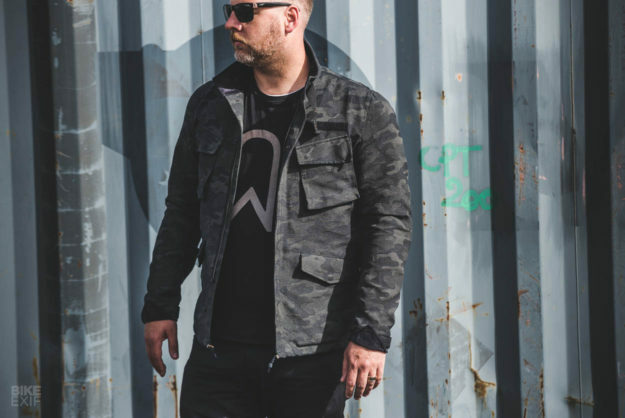 And while the jacket isn’t overly heavy, it does have a great, robust feel to it. It’s really well made too, with some really slick details in the mix. The collar and cuffs are lined with a plush, corduroy-like fabric, and both the collar closure and velcro cuff adjusters are made from really heavy duty nylon. 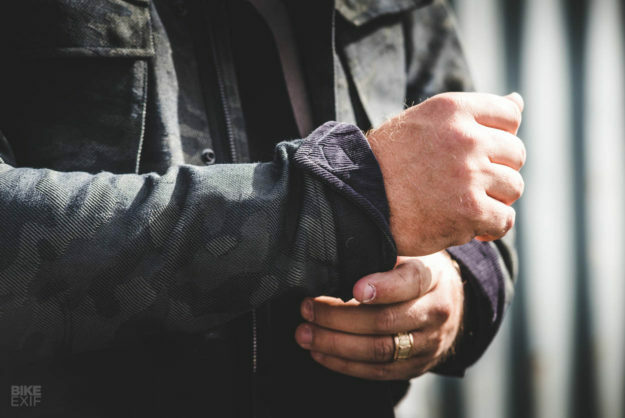 The cuffs even include triangular flaps that are held back by a velcro patch, and can be deployed to cover the gap between your gloves and jacket. They only work well up until a certain speed, when the wind just pushes them back into place. Branding is virtually non-existent, and the small inner pocket and velcro strip above the breast pocket (for attaching your name to) are both nice touches. Minimalism reigns supreme; there’s just one layer to the M65, with no built-in or removable liner. It ships with Knox elbow and shoulder armor, which is quick and easy to pop in and doesn’t add much bulk. There’s a pouch for a back protector, but the actual pad’s not included. 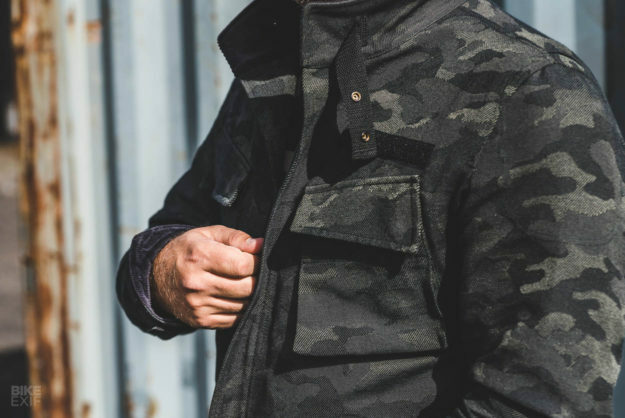 Given the styling, I was expecting the M65 to be an oversized affair, like a camo parka. But it’s cut a lot slimmer than it looks. I’m what you would call ‘cuddly,’ so I picked an XXL based on Pando’s size chart. It fits, but it’s a tight squeeze; if Pando made an XXXL, I’d get that instead. It’s not a problem if you’re in decent shape—but if you’re on the cusp of two sizes, carrying a little extra padding or want a roomier fit, check the chart, then go one size up. Despite the sizing, the M65 was supremely comfortable in the shoulder area. That’s because Pando have included a feature we see way too little of: bi-swing panels. (They’re basically gusseted shoulder blade sections, with elastic bits hidden inside the jacket to increase mobility.) They’ve also added adjustment tabs at the sides to cinch the jacket down. I wish the M65 came with better press studs though. They’re small and fiddly, and tricky to use with gloves on. I’d also build in hand warmer pockets, and I’d ditch the drawstring along the bottom. (The brass clasps on it have a nasty habit of jingling against your fuel tank.) I’d love to see Pando address those niggles, and maybe cut the M65 a little roomier. 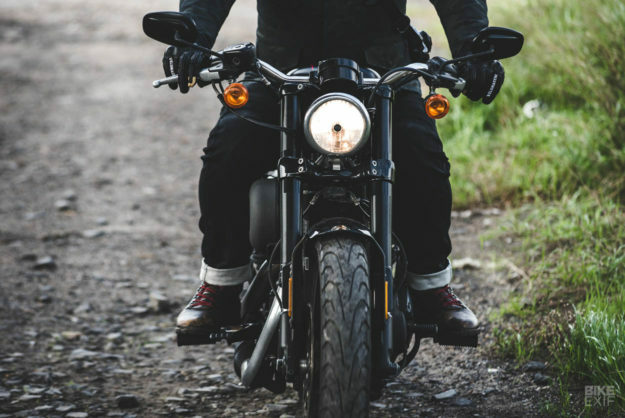 The basics: single-layer Dyneema chassis, CE-approved knee and hip armor, AU$350. I’m not ashamed to admit that I’ve been a long-time fan of Saint’s riding jeans. It’s true, they’re a bit on the pricey side—but their mix of style, comfort and protection is tough to beat. The Model 2 is an upgrade on the Model 1 that I reviewed some time ago. It’s a subtle overhaul, but the differences are notable. The Model 2 still uses the same material; cotton woven with UHMWPE (basically, Dyneema). If you want to run the numbers, Saint use 66 percent UHMWPE in high impact areas, and 10 percent in low impact areas. 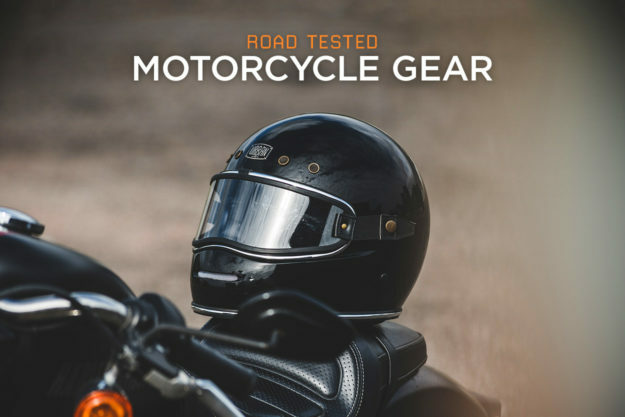 It’s a single layer construction that avoids the need for extra protective layers. And that means all-day comfort. The cut is best described as a relaxed straight fit, similar to a good pair of work pants. I prefer slim, tapered jeans, but we all have different tastes—and the wider cut makes the Model 2s easier to slip over bulky boots. I grabbed the same size as I would for any other denims, and the Saints fitted perfectly right off the bat. I wish Saint offered them in different lengths though; they only come in a 36 leg, which is long even for my six foot frame. The Model 2 ships with CE level 1 knee armor, and level 2 hip armor. 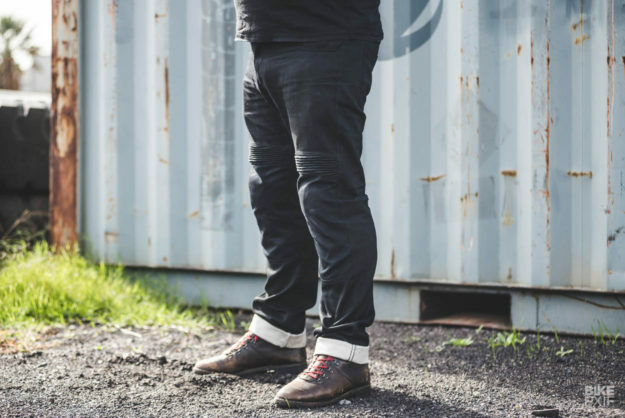 To keep things comfy, Saint have added accordion panels above the knees, and at the back, above the pockets. It’s a slightly different layout to the Model 1, but it cuts a much cleaner silhouette. The knee pads slip into mesh pockets, with high and low settings. It’s not the best design I’ve seen—the armor tends to sit a little off to the side, and on really hot days the mesh eventually irritates my skin. As for the hip pads, the pouches for those are made from the same hardy fabric as the regular pockets, which seems like a strange approach. A softer fabric in both areas would make a huge difference.